Stephenson et al. In press. A practical framework for implementing and evaluating Integrated Management of marine activities. Ocean & Coastal Management. Cottrell R, Nash KL, Halpern BS, Remenyi TA, Corney SP, Fleming A, Fulton EA, Hornborg S, Johne A, Watson RA, Blanchard JL. 2019. Food production shocks across land and sea. Nature Sustainability 2: 130-137. Sundstrom S, Angeler DG, Barichievy C, Eason T, Garmestani AS, Gunderson L, Knutson M, Nash KL, Spanbauer T, Stow CA, Allen, CR. 2018. The distribution and role of functional abundance in cross-scale resilience. Ecology 99: 2421-2432. Alexander et al. 2018. 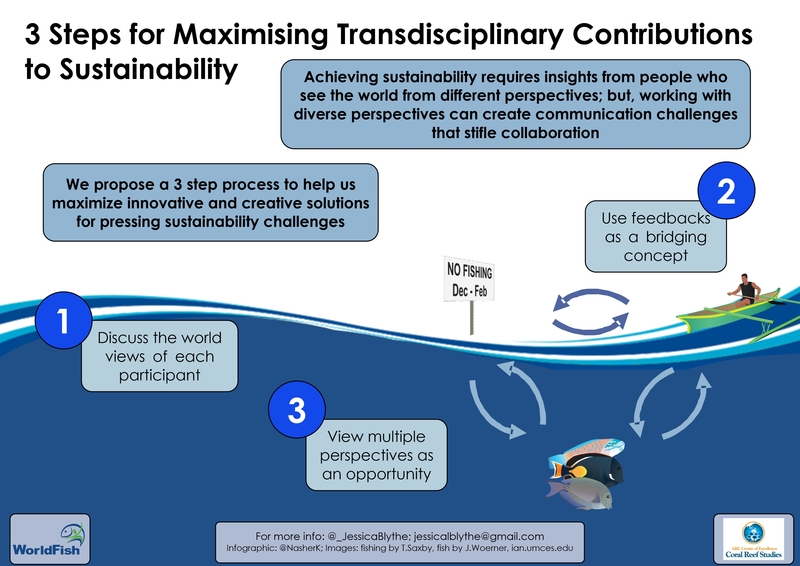 Progress in integrating natural and social science in marine ecosystem-based management research. Marine & Freshwater Research DOI: 0.1071/MF17248. Barichievy C, Angeler DG, Eason T, Garmestani AS, Nash KL, Stow CA, Sundstrom S, Allen CR. 2018. A method to detect discontinuities in census data. Ecology & Evolution DOI: 10.1002/ece3.4297. Harvey BJ, Nash KL, Blanchard JL, Edwards DP. 2018. Ecosystem based management of coral reefs under climate change. Ecology & Evolution DOI: 10.1002/ece3.4146. analyses of body size shifts’. Nature Ecology & Evolution 2: 757-758. Cvitanovic C, Hobday AJ, Mcdonald J, van Putten I, Nash KL. 2017. Governing fisheries through the critical decade: the role and utility of polycentric systems. Reviews in Fish Biology and Fisheries DOI: 10.1007/s11160-017-9495-9. Darling ES. Graham NAJ. Januchowski-Hartley FA. Nash KL. Pratchett MS. Wilson SK. 2017. Relationships between structural complexity, coral traits and reef fish assemblages. Coral Reefs DOI: 10.1007/s00338-017-1539-z. Spanbauer T. Allen C. Angeler D. Eason T. Fritz S. Garmestani A. Nash KL. Stone J. Stow C. Sundstrom S. 2016. Body size distributions signal a regime shift in a lake ecosystem. Proceedings of the Royal Society B 283: 20160249. Lefèvre CD, Nash KL, González-Cabello A, Bellwood DR 2016. Consequences of extreme life history traits on population persistence: do short-lived gobies face demographic bottlenecks? Coral Reefs 35: 399-409. Nash KL, Welsh JQ, Graham NAJ, Bellwood DR. 2015. Home range allometry in coral reef fishes: comparison to other vertebrates, methodological issues and management implications. Oecologia 177: 73-83. Angeler DG, Allen CR, Barichievy C, Eason T, Garmestani AS, Graham NAJ, Granholm D, Gunderson L, Knutson M, Nash KL, Nelson RJ, Nystrom M, Spanbauer TL, Stow CA, Sundstrom SM. 2015. Management applications of discontinuity theory. Journal of Applied Ecology 53: 688-698. Spanbauer TL, Allen CR, Angeler DG, Eason T, Nash KL, Fritz SC, Stone JR, Garmestani AS. 2014. Prolonged instability prior to a regime shift. PLoS ONE 9(10): e108936. Graham NAJ, Chong-Seng KM, Huchery C, Januchowski-Hartley FA, Nash KL. 2014. Coral reef community composition in the context of disturbance history on the Great Barrier Reef, Australia. PLoS ONE 9:e101204. Januchowski-Hartley FA, Nash KL, Lawton, RJ. 2012. The influence of spear guns, dive gear and observers on estimating fish flight initiation distance on coral reefs. Marine Ecology Progress Series 469:113-119. Nash KL, Graham NAJ, Januchowski-Hartley FA, Bellwood DR. 2012. 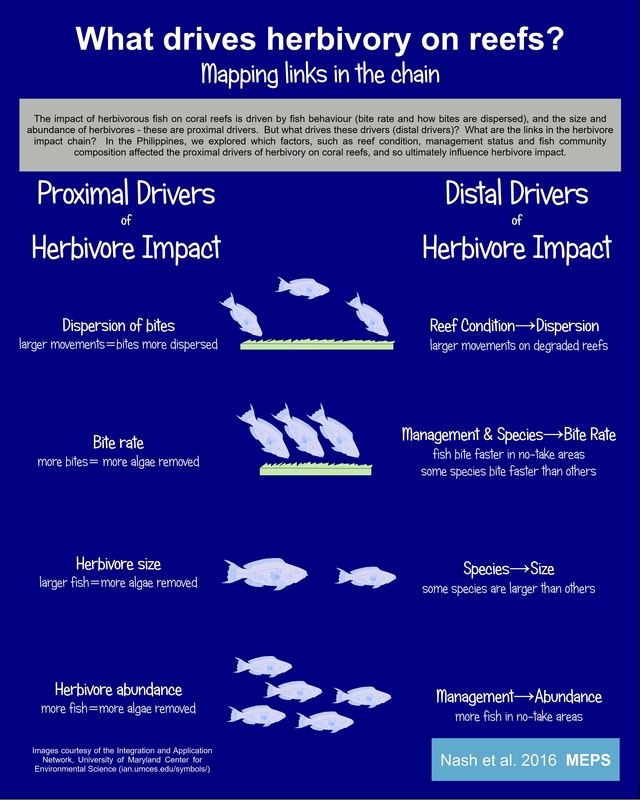 Influence of habitat condition and competition on foraging behaviour of parrotfishes. Marine Ecology Progress Series 457: 113-124. Wilson SK, Graham NAJ, Fisher R, Jennings S, Robinson J, Nash KL, Chong-Seng K, Polunin NVC, Aumeeruddy R, Quatre R. 2012. Effects of macroalgal expansion and marine protected areas on coral recovery following a climatic disturbance. Conservation Biology 26:995-1004.